This was our second cruise, we had been on our previous one in an inside cabin, so that is what we chose. I am claustrophobic, the cabin was way too small! I had a panic attack in the cabin, which was on level 8, and the hallways were so narrow too. I went to guest services and said I would be happy to pay for an upgrade, I was told the cruise was totally booked and I would not be able to change rooms. One woman took pity on me and told me to check back in case of no shows. Finally, after checking back a 4th time at almost 8:30pm, there was an oceanview room available, we paid a small upgrade and were happy with the big round window. It also was down a very short hallway and close to the elevator and stairs. We did have an employee use a key to get in, she said the room was marked unoccupied, they were giving those rooms to employees. We were just glad to have the better room, we didn&apos;t complain. Also with both the first and final room, our first keycards did not work, many passengers had the same problem, a minor inconvenience. The only issue I had with the cabin was the bed, it made a horrible clanging noise when we moved while on it. The food wasn&apos;t anything special, we mostly ate at the buffet so we could have a variety. The set up was pretty bad, most people waited on line which took forever and the food was cold by the time we got drinks and sat down. The other cruise we had been on had much better flow and accessibility, that would be a major improvement. We went to the Palace restaurant one evening, the service was wonderful, the food was ok. We are not big drinkers, the virgin mixed drinks were very good and the water is filtered. We didn&apos;t partake in any of the cruise activities, we like to relax and sunbathe while on the ship. My husband enjoyed watching the kids play basketball, we heard from many that the pool water was cold so we didn&apos;t even dunk our feet. We did a snorkel excursion both Tues and Wed of our trip. The one in Freeport was a 20 minute bus trip to the dock, the driver was entertaining and told many stories about the history of the island. The snorkel trip was great although the water was a bit chilly (March). The excursion Nassau was good, the water was a bit rough in the area we were taken to. 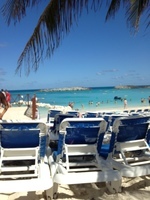 Thursday we went to Great Stirrup Cay, the island and the water are beautiful, plenty of lounge chairs. Food ok, we gave more to the fish than what we ate. All in all it was a good vacation despite the minor issues. We agreed that the food on our previous cruise on Royal Caribbean was better. The back of the ship is a nice place to sit and eat, it&apos;s too bad that is a smoking section. Getting on and off the boat was quite easy, deboarding in Miami was a breeze which we appreciated. Most of the employees were very kind and helpful which made for a pleasant trip. We will probably try another cruise line in the future unless they have some really good deals. Cabin window-made the room seem larger and was great for night stargazing. 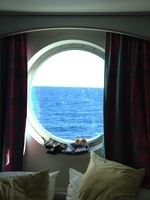 This was our second cruise, we had been on our previous one in an inside cabin, so that is what we chose. I am claustrophobic, the cabin was way too small! I had a panic attack in the cabin, which was on level 8, and the hallways were so narrow too. I went to guest services and said I would be happy to pay for an upgrade, I was told the cruise was totally booked and I would not be able to change rooms. One woman took pity on me and told me to check back in case of no shows. Finally, after checking back a 4th time at almost 8:30pm, there was an oceanview room available, we paid a small upgrade and were happy with the big round window. It also was down a very short hallway and close to the elevator and stairs. We did have an employee use a key to get in, she said the room was marked unoccupied, they were giving those rooms to employees. We were just glad to have the better room, we didn&apos;t complain. Also with both the first and final room, our first keycards did not work, many passengers had the same problem, a minor inconvenience. The only issue I had with the cabin was the bed, it made a horrible clanging noise when we moved while on it. The food wasn&apos;t anything special, we mostly ate at the buffet so we could have a variety. The set up was pretty bad, most people waited on line which took forever and the food was cold by the time we got drinks and sat down. The other cruise we had been on had much better flow and accessibility, that would be a major improvement. We went to the Palace restaurant one evening, the service was wonderful, the food was ok. We are not big drinkers, the virgin mixed drinks were very good and the water is filtered. We didn&apos;t partake in any of the cruise activities, we like to relax and sunbathe while on the ship. My husband enjoyed watching the kids play basketball, we heard from many that the pool water was cold so we didn&apos;t even dunk our feet. We did a snorkel excursion both Tues and Wed of our trip. The one in Freeport was a 20 minute bus trip to the dock, the driver was entertaining and told many stories about the history of the island. The snorkel trip was great although the water was a bit chilly (March). 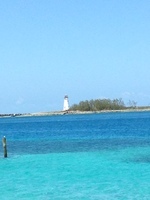 The excursion Nassau was good, the water was a bit rough in the area we were taken to. Thursday we went to Great Stirrup Cay, the island and the water are beautiful, plenty of lounge chairs. Food ok, we gave more to the fish than what we ate. All in all it was a good vacation despite the minor issues. We agreed that the food on our previous cruise on Royal Caribbean was better. The back of the ship is a nice place to sit and eat, it&apos;s too bad that is a smoking section. Getting on and off the boat was quite easy, deboarding in Miami was a breeze which we appreciated. Most of the employees were very kind and helpful which made for a pleasant trip. We will probably try another cruise line in the future unless they have some really good deals. Original room 8311 felt very small, hallway was extremely narrow. Claustrophobics need at least a window or a balcony to feel at ease. Bed make noise when we moved on it, cabin was clean and comforable otherwise. Showers are a tight fit, I am average size, my husband is big and tall. Didn&apos;t know we had to take a 20 minute bus ride to boat, but it was enjoyable. Excursion was great, lots to see and employees were kind and helpful. Island was beautiful! We enjoyed swimming and snorkeling on our own, the water is clear and so amazing. Food was just ok, no drinks offered by buffet. We had beer and virgin drinks which were very cold and refreshing on the beach. Very fast and easy to get on ship, however cabin was not ready to occupy. Water area was choppy and a bit rough for some people. We didn&apos;t see as much as our Freeport excursion and it seemed to be a much shorter trip. We had lunch at Senor Frog&apos;s which had a great view and better food than on the cruise.